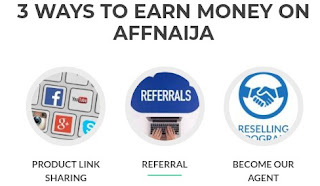 Have you heard of AffNaija affiliate? Well, let me introduce you to the network. AffNaija is a Nigerian driven network where you can make ₦10,000 or more just by sharing their merchant services on Facebook. You earn daily by the products you share on Facebook and referral method and this program is for students who are struggling to pay hostel and projects bill. 3 by becoming there agent. Registration is free! but a subscription is needed for you to start the earning process and marketing tools you will promote​. Basic Premium and Ultimate plan. Referral bonus. : ₦250 min and ₦1000 max. Referral bonus : ₦250 min and ₦1000 or ₦1,500 max. Are you okay with the explanation? Here is how to sign up for AffNaija and start earning. Check your email for verification link if you found out click on it and verify your account. choose the plan you would like to opt in for such as basic or premium and proceed to payment page. NOTE: you must have a working credit card to make payment for the subscription or otherwise you can use Vogue pay to make the subscription payment. Credits or debit cards that are acceptable. After payment is made your dashboard will now be active. How does AffNaija affiliate program work? If you have up to 300 freinds on Facebook there's is a bigger chance of earning more money this is because at least 50 to 150 of them might be interested in buying the product you shared with them. The whole thing is just with Facebook. Note that this referral is just an add-on to make extra money for yourself it is not compulsory to take part. 0 Response to "AffNaija review: How to make ₦700 to ₦4,500 daily and ₦10,000 or more monthly on AffNaija"